Below are some product and service announcements made at the American Society of Human Genetics 2017 Annual Meeting, held Oct. 17-21 in Orlando, FL. 10x Genomics and the Human Cell Atlas international consortium today launched a partnership designed to help enable pilot projects of the Human Cell Atlas (HCA), the first major effort aimed at mapping cells in the human body at unprecedented detail. 10x Genomics said it will partner with HCA researchers to help enable the massive cell-by-cell characterization and gene-expression profiling needed for the project. HCA consortium collaborating members, including researchers involved in individual projects and within larger pilots, will be able to purchase the 10x Chromium™ Single Cell 3’ and 5’ RNA Analysis Solutions at discounted prices, to use in their research. The non-exclusive partnership agreement between 10x Genomics and HCA is designed to help provide technical solutions for the Atlas’ pilot projects. Findings from each pilot project will be made available to the entire scientific community by the HCA international consortium. “Recent advances in single-cell technology have allowed us to look at cells with a clarity and depth of analysis that we have never been able to achieve before, making this ambitious project a reality within reach,” Aviv Regev, Ph.D., Director of the Klarman Cell Observatory and Cell Circuits Program at the Broad Institute of MIT and Harvard and co-chair of the Human Cell Atlas organizing committee, said in a statement. Separately, 10x Genomics also announced the launch of new products for the Chromium™ Immune Repertoire Profiling Solution using massively-parallel single cell RNA-seq (scRNA-seq) to sequence paired V(D)J B-cell receptors, plus unbiased gene expression, for reading the immune-repertoire along with cell phenotype. The new B-Cell and 5’Unbiased Enrichment Kits will add to 10x’s Chromium V(D)J Solution for Immune Repertoire Sequencing, launched last spring for paired T-Cell receptor sequencing. The new products add features to the existing solution that include unbiased digital gene expression via 5’ cell-linked barcoding and UMI tagging of cellular transcripts on a single cell basis, together with full-length, paired human B-cell immunoglobulin sequencing, including isotypes. According to 10x, the full combination of features now enable a single sample to be analyzed simultaneously for cellular heterogeneity, phenotype, T-cell receptor repertoire, and B-cell immunoglobulin repertoire. variation and detect variants in previously inaccessible and complex regions of the genome. TSC houses several high-throughput NGS instruments for large-scale whole genome sequencing. 10x Genomics is at Booth #748 at ASHG17. Genewiz has launched a pair of expanded next-generation sequencing (NGS) services. The global genomics service provider has branched out into clinical genomics testing with its new CLIA Sanger Sequencing service, which is CLIA-certified and CAP Accredited. Genewiz said its clinical Sanger sequencing will complement the work of its research and clinical clients. Also rolled out by Genewiz is its Amplicon-EZ service, designed to provide a cost-effective, fast, and interactive solution for researchers to sequence mixed PCR products. Amplicon-EZ is also intended to enable researchers to use NGS regardless of sample number or expertise. Starting at only $50/sample, the service delivers what Genewiz says are easy-to-interpret results in three business days. Amplicon-EZ expands Genewiz’s amplicon sequencing services to three comprehensive options, including standard amplicon sequencing and contiguous long amplicon sequencing, using Single Molecule, Real-Time long-read sequencing, which is also new to Genewiz. Additionally, Genewiz has partnered with PacBio® on the newest SMRT® Grant Program, open to researchers worldwide who seek to identify and characterize structural variants. The winner will receive long-read sequencing for up to three samples and 16 SMRT Cells, plus bioinformatic support. To enter visit web.genewiz.com/pacbio-sv-grant and fill out the entry form, including a 250-word proposal for how you would use PacBio long reads from the Sequel® System to identify and characterize structural variants. Entries close at midnight (ET), December 11, 2017. Genewiz is at Booth #323 at ASHG17. 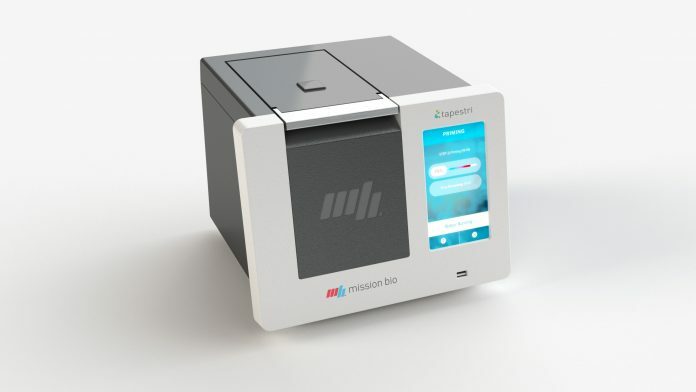 Mission Bio, a provider of single-cell DNA analysis, has secured $10 million in Series A funding led by Silicon Valley venture capital firm Mayfield Fund. The financing is designed to support the launch of Tapestri™, a platform designed to support the discovery, development and delivery of precision medicine. Tapestri leverages proprietary droplet microfluidics to provide single-cell DNA analysis and throughput, enabling detection of genomic variability within and across cell populations. The platform includes an instrument, consumables and software. With throughput up to 10,000 cells and DNA accessibility at the single-cell level, Tapestri is intended to enable researchers and clinicians to identify—with what Mission Bio calls unprecedented scale and sensitivity—important differences among cells within a patient sample that may impact disease progression and treatment. Mission Bio is joining with early-access customers from The University of Texas MD Anderson Cancer Center and Stanford University School of Medicine in presenting the Tapestri platform at ASHG. Mission Bio is at Booth #1045 at ASHG17.